I am not sure how a City Council campaign could be conducted in any worse a way. From those naked Facebook selfies to his bold postcard proclamation this week that he supports more water, Noah Green's campaign for City Council has been something of a trainwreck. And then there is this magical sentence that, should it ever come to happen, would make Sierra Madre's yellow water seem like something out of a golden era. One that we'd gladly sell our fiduciary souls to the SGVMWD to bring back. Recycling/Grey Water - This would install recycling facilities in homes and businesses to help replenish our groundwater and to recharge our existing wells. As much as I am in favor of using whatever means possible to help our city deal with the effects of the 500 Year Drought, I am not certain that filling our currently near empty wells and aquifers with gray water is the solution any of us should be hoping for right now. There has simply got to be a better way. I am not sure that Noah quite understands the whole gray water concept. Though he does go on to state that he is in favor of more water, which is probably a better thing than the alternative. And did you know that the reason Sierra Madre is an "independent entity" is because we the residents pay the highest utility taxes in California? Here I thought that money went to help pay for emergency services such as our police, fire and paramedic departments. This does makes you wonder exactly who or what we've been paying a million dollars a year in ransom to all of these years for our independence. Perhaps a militarily adventurous Pasadena? Or that Noah would like to see all of the empty stores downtown filled up with new businesses? A rather bold statement, and one that could cost him the votes of those many politically active people in town who want those storefronts to remain empty. Folks that up until now were probably quite happy with current Chamber of Commerce Vice President Noah Green as our downtown has never had as many vacant shops as it does today. I really don't think that there can be much doubt. We are truly living in troubled times. Please note the second comment. Does anyone remember a couple of years back when the police hauled an SUV down behind the police station for processing? Seems that someone was sleeping in the back and as he was getting out when the door was open an officer shot that person in the back. Is that correct? Anyway I hear that officer got a promotion. Is that also correct? And while I'm asking was there a police car involved in an accident some weeks back? It wasn't the same officer was it? Sorry to ask about old news but I would like to know the what happened. Thank you tattler. Nobody has been able to get an answer to that question. The only substantial clue is that the city paid several thousand bucks to get one of their Ford cruisers repaired. Anybody up for solving this mystery? that was Dead Eye Officer Amos and the settlement was not made public. Not sure if he got a promotion. I was just amazed that he was able to get the bullet out of his pocket, load his gun and fire off a round. I though Noah liked bigger dolls. where did this creepy picture of Noah come from? but wait, he's a "lawyer"
I, too, received Noah's card yesterday. I was confused/amused by by Noah's declaration of Independence for Sierra Madre. He seems to believe having our own police and fire is what makes one and independent city. Really? What about La Canada and Lakewood? These cities are independent cities yet they contract out for lots of services like police (sheriff) and fire. I do believe what makes an entity independent is their Charter not the number of services it "owns". Our boy Noah needs to go back to law school. The LCF public library is still owned and run by the County, as well. The residents support some of the special programs as a non-profit. two years of living in the city and he has all the answers - typical lawyer. our fire dept is a volunteer FD in a major metropolitan area and I for one would rather call the Arcadia FD. 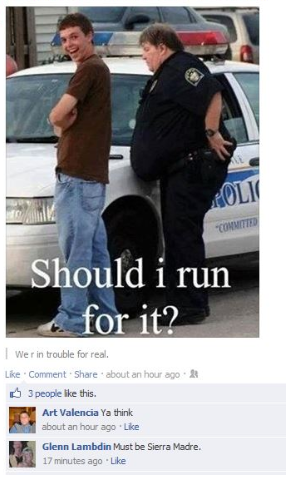 What that kid doesn't know is that that officer is probably a crack shot. Yes. Especially if he tried to touch his toes. Noah has more signs in Pasadena - his support is stronger there. On Green's card it says he has been here for "several" years. Anyone know exactly what that means? I think it means Noah doesn't want you to know that he has been in town for only two years. Did he pass the bar or is he in the bar? He's not sure. Get back to him later this week. Noah did not vote in our last election because he did not live in sierra Madre at the time. The word "law" is used on Green's card 6 times. Did I say I was a lawyer? I'm a smart guy. I passed the bar. Did you know I'm a lawyer? Please address all questions to the doll. Maybe when Noah's on council he'll have one of those ventriloquist dolls speak for him. Someone drive around town and mark all the addresses of any Sierra Madre residents who have this idiot Green signs in their Yard!!!! I want to eliminate them from legitimate walking and mailing lists. They probably do not. even vote or else they are crazy. Many of them do not know. I was canvassing over the weekend and I asked one woman if she knew who Noah Green was. She didn't, the sign was in her yard because someone she knew asked her to put it there. I pulled out my iPhone and showed her the facebook pictures. She practically ran to take it down. I think Noah was talked into doing this by the lazy crazy ladies running the Chamber of Commerce. Noah probably thought all he'd have to do is show up and keep his tie tied and his smile plastered on his mug. He was not in anyway prepared for a Council run in Sierra madre. Because being a total newbie, he didn't have a clue. 10:08.....why don't you do it? I would vote for someone if they lived here for 10 days as long as they demonstrated an understanding of the issues and provided lucid and rational solutions to those issues, whatever they may be. This notion that duration of residency be a litmus test for qualifications to run for political office is ludicrous. Friends don't let friends support Noah Green. Is that picture legitimate? In other words, is real or a photoshop? If so, This is really off the wall and he should be treated as a teen rather than a candidate. It was peeled off Noah's Facebook page with all the rest. Legit. didn't he say that he thought Facebook was private? what an idiot. however, I did like the sting cause I have almost been hit in the crosswalk by Bean Town while pushing a stoller the driver was on the phone and never saw me. As the car passed me I tossed my coffee on it's trunk. why doesn't Noah do something positive on the Chamber before he decides to run for Council? why doesn't he open a doll shop? Mannequins are much bigger dolls. At 38 years of age a man should have put his dolls aside by now. It doesn't show very much self confidence. Maybe that is why he carries a doll. Dear Tattler, Normally I enjoy visiting your site but sadly, today's post showing Noah photo-bombing a baby doll has just totally creeped me out. I wasn't bothered when Noah Green posted naked pictures of Himself on the internet in front of God and Everybody. I mean, it was clear evidence that you can trust Noah to hold his beer better than he'd hold public office. These days our government strategy needs bare bones, not bare butts. But today's photo! It's just too far off the weirdo scale. I hope people will not be so foolish as to vote for this individual. If he wins we'll have to look at scary pictures like this for years! Imagine the pose he'd strike with our beloved Huck Finn statue! Oh, the horror! Please, just say No to Noah, Sierra Madre. Don't worry, he'll get over it. Agalmatophilia (from the Greek agalma 'statue', and -philia φιλία = love) is a paraphilia involving sexual attraction to a statue, doll, mannequin or other similar figurative object. The attraction may include a desire for actual sexual contact with the object, a fantasy of having sexual (or non-sexual) encounters with an animate or inanimate instance of the preferred object, the act of watching encounters between such objects, or sexual pleasure gained from thoughts of being transformed or transforming another into the preferred object. The sexual stimulation results more from a need of control and sexual gratification without emotion from either counterpart. It can be easily misunderstood as a shallow, cruel, and heartless depiction of sexual stimulation, and although this may be true for some, it is not true for all. Some use this as a way of performing derogatory acts without actually harming anyone…Agalmatophilia is a difficult concept to comprehend, especially when considering the mental states behind these fantasies. However, one should always consider whether the actions harm real individuals or not. In some cases, this is just a derogatory fantasy. For others, this is just sexual gratification that stems from loneliness or the lack of confidence in an ability to find a partner. Noah needs love and understanding to help him with his agalmatophilia. I understand that all council members get gold level full family medical coverage paid for by the City. Hopefully after Noah is elected he will get the help he needs. WE LOVE YOU NOAH! Would he be bringing his dollies to city council meetings, 1:57? Interesting question. We would have Madame City Attorney, Madame City Manager, and Madame Noah's Doll. If Noah's doll calms him and gives him comfort why would you care? Valid point. However, is the need of a 38 year old man to be comforted by a doll a quality we should want to see in a City Councilmember? 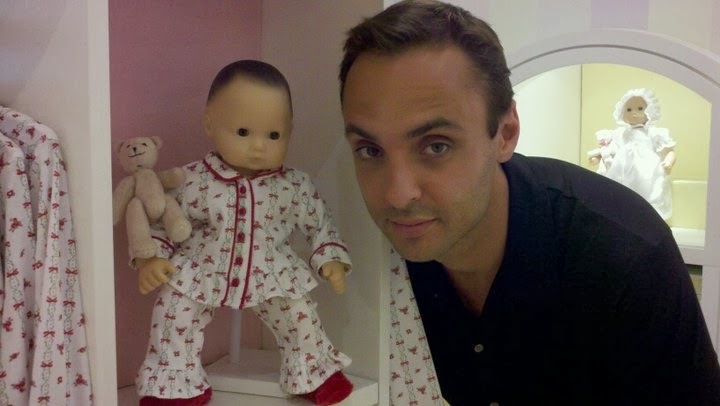 John Capoccia doesn't carry a doll. Capoccia and Harabedian will both need dolls when they come up for reelection in 2016 and they have to explain why they signed the ballot argument in favor of Measure UUT. Maybe Noah's hoping for that Pygmalion thing. If so, he's got nowhere to go but up. 1:44.....get over yourself, that's a pretty good stretch from that picture to that 40 dollar word you see gleefully Google and copied and pasted, do you know the context in which this picture was taken, I'll answer that for you, no you don't, but you equate this picture with some strange sexual disposition, very odd to make a quantum leap like that. 5:24 may have a valid point. perhaps folks are reading too much into these photos. perhaps the real truth is is that no sane female would ever want to be photographed standing next to Noah, so he has to resort to pretend women made of plastic. It's always the mother's fault. Creepy and irrelevant. I hope. On the basis of what we've seen and heard so far, let's agree to stipulate the following: In the State of California, Noah Green, Esquire is clearly qualified to serve at the Bar. From 9 PM to Closing, Tuesday to Saturday. Last call 2 AM. On the City Council of Sierra Madre? Nope. Not so much. Like most California drinking establishments, the Buc has a one mannequin policy. If you want to bring more you need to move to Utah. What a disaster this guy is. How embarrassing for our town. Yes. There are very strange people on the Chamber now. Still no Noah Green sign in front of John Buchanan's house. Just the Goose. I wonder why? Will there be a press release?